Posted on 2011-07-24, by trickyexpert. * Vibrant illustrations and simple accessible lesson pages are designed for clarity and ease-of-use with learners at all levels. 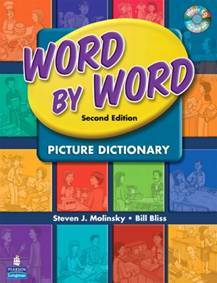 Word by Word is the most learner-friendly picture dictionary â€” especially for Beginners. * A careful research-based sequence of lessons integrates students'''' development of grammar and vocabulary skills through topics that begin with the immediate world of the student and progress to the world at large. * A new Teacher ''''s Guide and Lesson Planner with CD-ROM in a colorful user-friendly format includes lesson planning suggestions, community tasks, WordLinks for expanding vocabulary themes through the Internet, and reproducible masters to save teachers hours of lesson preparation time. The outstanding audio program includes all words and conversations for interactive practice, and â€” as bonus material â€” an expanded program of WordSongs for entertaining musical practice with the vocabulary.